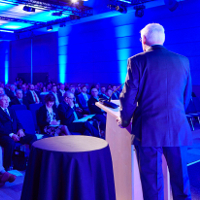 Richard Jenkins, NSI Chief Executive commented: “This one-day NSI Summit is an intense value-packed must-do event bringing together the UK’s elite security and fire safety professionals. It’s a valuable, convenient and highly enjoyable opportunity for approved companies to keep up to date with the latest thinking and innovation in their marketplace. Gerry Dunphy of UBM, responsible for the UK’s largest security event, IFSEC International, stated: ‘’The NSI is in a unique position with regards to its long-standing relationship with the installer community to provide this exclusive opportunity for buyers and suppliers to come together.